According to a recent study, people spend around five hours per week maintaining their home. Considering that our increasingly hectic lives mean more work and less time, you may just need a helping hand. Cats love being clean, and spend a good portion of their time grooming themselves, or each other. A cat may choose not to use their provided litter if it’s not clean, and in some cases, this can result in health problems. That’s why in this article I will outline all the reasons for which you may wish to opt for a Litter Robot III, giving you the top 4 reasons to justify your purchase. What Is the Litter Robot III? If this is your first time hearing about this modern product, you may be scratching your head trying to figure this one out. The Litter Robot III is an automatic litter box, which according to reviews, is the best the marketplace has to offer. Needless to say, there are two types of litter boxes out there: on the one hand, the reasonably priced ones provide reasonable-enough features; on the other hand, when you bite the bullet on the price you get high-specification products which will last for a long time. Regardless of your choice, it’s important to remember that nothing is 100% reliable, meaning that you will still need to tend to the device every once in awhile. However, featuring a full indicator light which will show you when the waste has reached maximum capacity, you will know when it’s time to intervene. Unlike the trick that people fall for (i.e. with coffee machines, wax heaters; hoovers); the Litter Robot III does not require any brand supplies in order to operate. Usually overpriced, mostly just because you need those accessories, you won’t require any of the company’s waste trays, crystals, liners, and a whole army of other products. The only thing which is essential is a good litter and trash bags. I personally find this to be an advantage because in this way you don’t disrupt the routine and habits of your cat. This is particularly important for elderly cats that may prefer one type of litter over the other. If you have ever been a parent, you will think that cleaning cat feces is a walk through the park. However, this doesn’t mean that you want to do more than you absolutely have to. For example, with many automatic litter boxes with rakes, you usually need to smooth out and spread the litter. Personally, for me, it is a big plus not having to deal with the frustration of the above 3 situations. However, as we are all unique, it may just be that this is not a deal breaker, for you. If you’re pulling a face right now or nodding your head, it may be safe to say that you understand. Having experienced a small “accident” of that type, it’s more than like that you’re not looking forward to that happening again. The good news is that due to the circular shape of the Litter Robot III, your cat is less likely to have these accidents. The no corners and edges mean that even if the feces reach the wall of the machine, they will drop to the rubber and not the floor. Ultimately, everything will go to the waste bin, so no more surprises for you. Talking about cleaning, the globe and waste drawer are incredibly easy to clean. And you won’t need to stress out too much about doing it either, as it’s recommended to give it a rinse only once a month. Obviously stay away from rough products such as bleach, but you can use mild soaps and detergents. 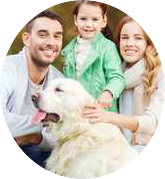 Waste disposal will depend on you and your cats. This includes the number of cats which use the litter, how old they are, and general environmental temperature. As we’ve seen above, there is only very minimal work involved in maintaining this chic litter box, and your litter will only need changing once a week, just to keep things fresh. Another common problem which cat owners have is the big clumps which form after your four legged friend urinates. Because the situation is quite sticky, literally, litter gets stuck to the bottom of the box. And that’s unfortunate because any litter cleaner with rakes will not be able clean the lumps, so the job will fall to you. There is light at the end of the tunnel, however: the Litter Robot III has a gentle rotation mechanism which gets rid of any clumps, and in fact, it is so quick that the clumping doesn’t usually even have time to occur. However, just to make things easier, the thick rubber we had previously mentioned destroys any existing lumps, and the bottom is released. 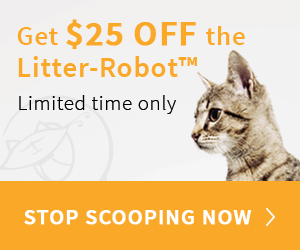 Before purchasing the Litter Robot III, I would have described myself as the type of person who didn’t mind cleaning after my cats. However, I must say that now I’m a bit of a fan, and that’s because I never realized how relieved I would be to get rid of it. And this is particularly helpful if you’re pregnant, as the job that will now fall to your partner or husband will be at least 70% easier! Click on the $25 off banner above to save now! 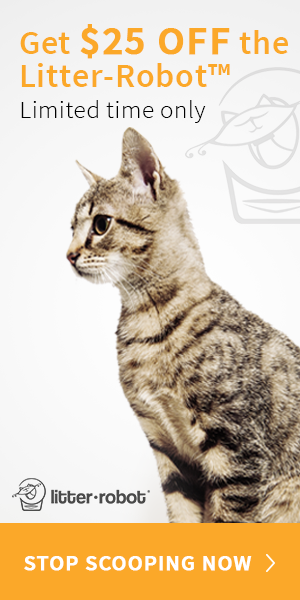 Check out this guide on more self cleaning litter boxes!